The mother of one of the Hamas kidnappers who the IDF has identified as being behind the June 12 abduction of three Israeli teens has spoken out, both denying his involvement yet saying if he is behind the abduction "I'll be proud of him till my final day." The revelation comes in an interview with Channel 10 by the mother of Amar Abu-Eisha (33), whose identity, along with that of Marwan Kawasmeh (29) was released by the IDF last Thursday, as the main actors behind the abduction. 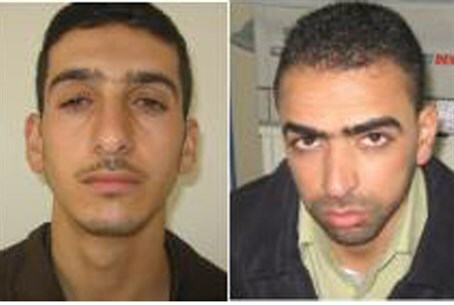 The two are known Hamas terrorists from the Hevron region. "They're throwing the guilt on him by accusing him of kidnapping. If he truly did it - I'll be proud of him till my final day," said the mother in a cold voice, reports the news channel. Speaking from her home in Judea, the mother claimed that on the day of the kidnapping, Abu-Eisha told his wife he was going to work and could be late coming home. "If he did the kidnapping I'll be proud of him. I raised my children on the knees of the (Islamic) religion, they are religious guys, honest and clean-handed, and their goal is to bring the victory of Islam," continued Abu-Eisha's mother. Abu-Eisha's father Omar himself has been arrested numerous times for security offenses according to the IDF, and Amar's brother was killed while committing a terror attack in 2005 against an IDF patrol. It was reported on Monday that Omar Abu-Eisha was arrested by security forces along with most of the kidnapper's close family, in arrests that Palestinian Authority (PA) security forces cooperated in. "May Allah take revenge on them," said Abu-Eisha's mother of the PA forces. "They are helping the IDF." Abu-Eisha's uncle, who is himself known to security forces as an extremist Hamas activist, denied his nephew's involvement. "Amar is mentally unwell, even one small push by a young kid and he falls to the ground. Is it logical that he could conduct the kidnapping they're attributing to him? Three kidnappings?" stated the Hamas activist uncle. Omar spoke about his son last Thursday, in a response the same day that Amar's name was announced in connection to the kidnapping. At the time, Omar said that on the night of the abduction, he went with Amar to a cousin's wedding at 8 p.m, and around 10 p.m. he found Amar had disappeared, and has been missing since. It should be noted that a motorist saw Eyal Yifrah (19), Naftali Frenkel (16) and Gilad Sha'ar (16) at a hitchhiking stop at 10:05 p.m. that night, and at 10:25 p.m. police received an emergency call from one of the teens whispering "we've been abducted! We are being kidnapped." The call was ignored by police who thought it was a prank call, a failure that has raised a public outcry. Given the two reported times, it appears that Amar has been missing since before the time of the kidnapping, which occurred just after 10 p.m. Nevertheless, Omar insisted "the story of the abduction isn't logical. I don't believe all that. Whether he was arrested by soldiers or became a martyr, it's the fault of the Israelis in any case. Now it's in G-d's hands, I can only pray in the meantime."